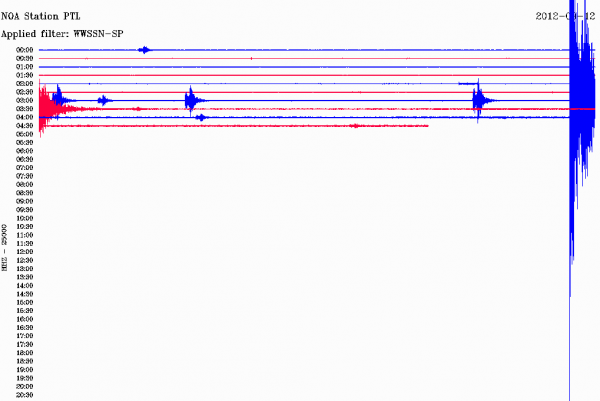 Strong eathquake measuring M5.6 hit island of Crete, Greece at at 03:27:45 UTC on September 12. Location of epicenter was near island of Gavdos, 79 km (49 miles) S (177°) from Chania, Crete and 119 km (74 miles) WSW (241°) from Iraklion, Crete, Greece (34.811°N, 24.064°E) at depth of 20 km, according to EMSC. USGS registered M5.5 at depth of 27.4 km (17.0 miles) and GEOFON registered M5.4 at depth of 10 km. Ground shaking lasted about 15-20 seconds. There are no reports of serious damage or injuries. 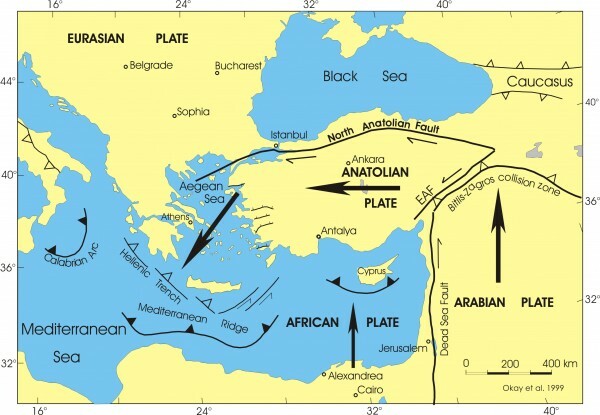 The seismotectonics of southern Greece are governed primarily by the motion of the Africa plates with respect to the relatively small Aegean Sea plate. Most shallow earthquakes in central and northern Greece (depths less than 50 km) result from interaction between the Eurasia plate and the small Aegean Sea plate, which is moving southwest with respect to the Eurasia plate with a velocity of about 30 mm/year. The boundary between the Aegean plate and the Eurasia plate in central and northern Greece is diffuse. Seismicity is concentrated in east-trending and northeast-trending zones of deformation. The east-trending zones are most prominent in mainland Greece, are characterized by predominantly normal faulting, and have produced earthquakes with magnitudes of about 7. The northeast-trending belts are characterized by predominately strike-slip fault earthquakes. A northeast-trending zone of predominantly strike-slip earthquakes occurs off the west coasts of Cephalonia and Lefkada, western Greece, and other northeast-trending zones occur beneath the Aegean Sea east of the Greek mainland. In the twentieth century, an earthquake of magnitude 7.2 occurred on a northeast-trending strike-slip fault beneath the northern Aegean Sea. 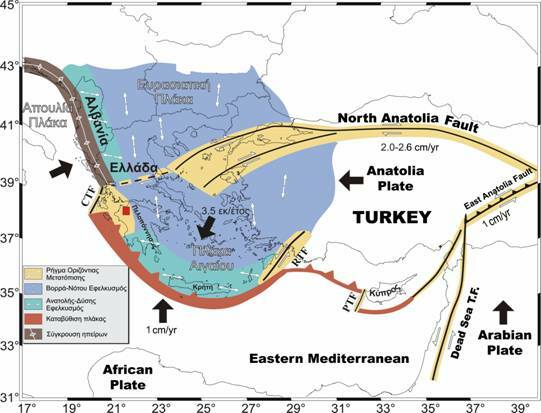 The Africa plate subducts beneath the Aegean Sea plate along the Hellenic arc, from the western Peloponnesus through Crete and Rhodes to western Turkey, at a rate of almost 40 mm/year. Shallow-focus earthquakes (focal depths less than 50 km) occur on faults in the boundary-region of the two plates. From Crete to the west and northwest, most shallow earthquakes near the Hellenic-arc plate boundary are produced as the result of reverse or strike-slip motion, although some normal-faulting earthquakes do occur. To the east of Crete, the Hellenic-arc plate boundary is characterized by normal-fault and strike-slip earthquakes. In the twentieth century, the largest shallow-focus earthquakes to have occurred near the Hellenic-arc plate boundary had magnitudes of about 7.2. Historical sources and archeological studies suggest that earthquakes centered near Crete in 365 AD and 1303 AD may have been much larger than any Hellenic arc earthquake of the twentieth century. In other parts of the world, convergent-plate tectonic environments similar to that of the Hellenic arc have produced earthquakes of magnitude 8 and larger. 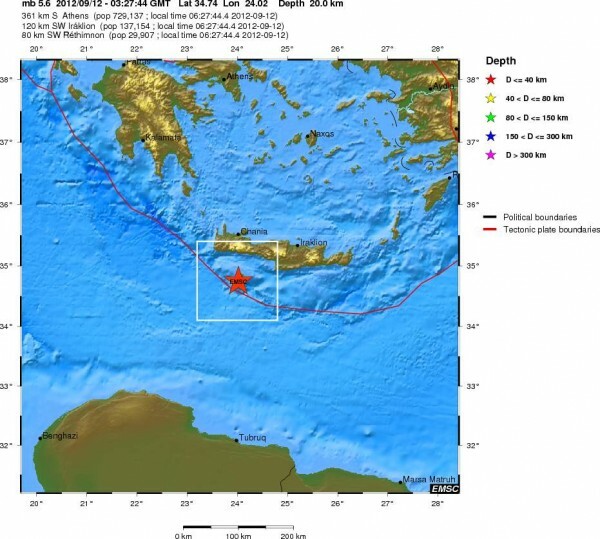 Shallow-focus earthquakes also occur in the volcanic arc that is associated with the subduction of the Africa plate beneath the Aegean Sea plate, in the Dodecanese and Cyclades Islands, over 100 km north of Crete. The region near the volcanic arc is characterized by normal faulting. The magnitude 7.8 earthquake of July 9, 1956, south of Amorgos, produced a large tsunami that affected the entire Aegean Sea. Intermediate-depth earthquakes (depths greater than 50 km) occur within the subducting Africa plate beneath central Greece and the Dodecanese and Cyclades Islands. An earthquake having a focal depth of about 100 km and a magnitude of 7.7 occurred beneath the Dodecanese Islands in 1926. Intermediate-depth earthquakes typically cause less damage on the ground surface above their foci than is the case with similar magnitude shallow-focus earthquakes, but they are sometimes felt at greater distances from the epicenter. A belt of shallow-focus seismicity along the western coast of Greece to the north of Lefkada, and extending north along the Adriatic coast of the Balkan Peninsula, is characterized by reverse fault earthquakes occurring in response to northeast-southwest crustal convergence. This zone produced an earthquake of magnitude 7.0 in 1979, centered beneath the coast of Montenegro.